Two Bears Farm and the Three Cubs: Making Soda and the Giveaway Winner! Making Soda and the Giveaway Winner! I know I've mentioned before that I have this addiction to Diet Pepsi. Oh how I love Diet Pepsi. I don't drink coffee, but every morning first thing I have a soda. So for our anniversary last month, Paul got me a Soda Stream. You can make all of your own sodas with it. Using your own water, carbonating it, and then adding the flavoring. We have really great water from our mountain well. The Soda Stream is green, because you don't use all those cans and bottles. It's healthier, because it uses less caffeine and splenda instead of aspartame. I've found I can make the sodas with 1/3rd of the syrup recommended and I don't notice the difference. In fact, I thought they would be kind of gross, but they actually taste really great. Definitely a high quality soda. And I like drinking our plain water with just carbonation added too. And now, thanks to all the people who entered my muffin tin and holiday cookbook giveaway. The winner, according to Random.org is comment #12 - JDaniel4sMom! 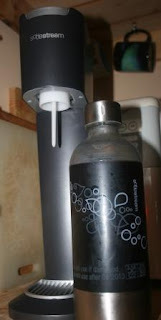 I am really curious about these Soda Stream contraptions! I've heard very few reviews on them and they have them in NZ, but I've been hesitant to buy any. I'm glad to hear that you like them! That's pretty cool!! How much easier and better for you!?! Never heard of it if before but that would be so cool!! So, when can I try this new creation?... :)JP (aka your neighbor, the "babysitter")Actually, Baby Girl, forget the soda...I'll take my vanilla! i want to get one of those soda makers. Paul made me grapefruit soda and it was super delish! I also tried the Diet Coke and thought it was much better than the stuff in cans. How cool is that! I don't think I've ever heard of that before.